The aspect of purpose and character aims to decipher whether the fair use of the copyrighted material was done for elevating the knowledge of the general public or to distort the objectives of the copyrighted material for personal profit. The nature of the copyrighted work primarily deals with the facts and ideas that have been copied from it. Fair use of such facts and ideas copied from factual work in the public domain, has larger scope than copying of fictional copyrighted work. The scope of fair use is limited when it comes to unpublished works, as the author has the privilege of control over the first public manifestation of it. The amount and substantiality of the copied segment, deals with the extent or percentage of copyrighted work that has been copied into the new work. 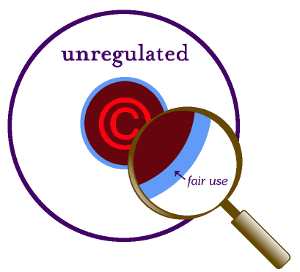 Fair use is considered valid if a small percentage of the copyrighted work is incorporated into a new one. Complete usage or replication of copyrighted material in a new work would be considered as copyright infringement. The effect of the use of copyrighted materials deals with the consequences it may have on the copyright owners market. The consequences could include adverse effects on the commercial viability of the original work. Such negative outcome cannot be considered as fair use.